Every time I walk out onto the stage I surrender more and more of myself – trusting and swimming in the freedom of the moment with a deeper consciousness. I tap into the energies of my soul, knowing I’ve come to breathe with those in the audience. Quieting my mind I share with greater clarity and sincerity in the eternal moment. What does it take to act from the heart and soul? The Courage to overcome fear and limitation. Sometimes we may be drawn off our path or the unexpected may occur. That’s when we need to take the time to draw upon our courage, to be willing to step back into the light and know just around the corner there’s an even greater possibility for expansion. The Love inside that’s just waiting to be released. When we’re able fill the space with all the love and joy in our heart – a true authentic and honest connection can take place. The Passion that comes from the core of our being, aligned with our soul’s desire, is one of the greatest gifts we can offer our self and others. When we’re free enough to release the deepest vibrations of the eternal part of ourselves, our passion can be an illuminating experience of truth and magic. The Humor of just having fun, falling down, picking ourselves up and laughing. Filling our heart full of joy. Singing, dancing to our heart’s content. Allowing exuberance to fill our entire being and all those around us. The Trust to connect to the richest part of our Self, to nature, to let our soul sing with every cell of our being. Trusting everything that’s been placed in our path is there to help us grow and expand. Trusting and accepting it willingly, with a glad heart and an open mind. The Knowing that comes from not having to judge or control others. By paying attention and remaining open, we give ourselves permission and the freedom to simply “be” and to “fly” – accepting all of life in its simplicity – allowing our consciousness to truly awaken our heart and soul. The Compassion to feel what others are feeling with total empathy, innate understanding, no matter the situation. We may not always know why we’re being asked to do what we’re being asked to do. So give more. The Truth in finding your own inner voice can lead you on a never-ending journey of self- self-discovery and self-realization. As long as we’re willing to be open enough to continually challenge our preconceptions, prejudices and habits, our heart and soul will lead us forward. By developing our moral compass, we enable ourselves to expand from a grounded state of truth, vibrancy, and understanding. The Communication of language and behavior – the simplest vibration, energy, movement, light particle, or wave carries within it all the seeds of our past, present and future. Universes of thought and spirit just waiting for our permission to dance with them in ever-ever- expanding ways. The Transformation of our entire body, mind and spirit fused into an instrument for storytelling carries within it all of creation. By having a strong work ethic, discipline, tactfulness and respect for ourselves and those we work with, we give ourselves permission to transform, allowing the audience to be truly awakened. The Listening that comes from mindfulness, intuition and discernment. Listening to the still small voice within – to all the sounds of nature – so slowly, slowly, we can begin to re-discover not only our Selves but all the wisdom of creation. The Surrendering to open our heart with kindness and compassion for all. The willingness to share our talents in the truest way possible – this is the ultimate gift to ourselves, the world, and the universe. What continues to give me my faith as an actor are all those joining me on my journey who have come before me, and those who continue to inspire me today … Mandela, Harold Clurman, Aung San Suu Kyi, Martin Luther King, Jr., Eleanor Roosevelt, Gandhi, Albert Schweitzer, Thích Nhất Hạnh, the Dalai Lama, Rabindranath Tagore, Oprah Winfrey, Louise Hay, Elie Wiesel, Joan Baez, John Lennon, Ilona Selke, Rita Fredricks Salzman, Sabra Jones, Alida Brill, Marilise Tronto, among others … who have drawn upon the richness of their moral compass, by searching deep within themselves, have expanded the preciousness of life through their goodness and humanity. RONALD RAND Alec Baldwin: “One of the great dedicated artists of the American Theater.” Founder and Publisher of “The Soul of the American Actor,” now in its 15th year, it is the only wide-world Newspaper in print and online dedicated to the art of the theater, reaching over 25,000 readers. Author of the best-selling book, "Acting Teachers of America,” it is the most comprehensive book published on today’s most influential acting teachers in the United States. Mr. Rand co-wrote the screenplay for the upcoming feature film, THE GROUP with Oscar-nominated filmmaker, Joan Micklin Silver. A Fulbright Teaching Specialist – hailed as a “Cultural Ambassador of America,” Mr. Rand brings to life Harold Clurman, considered “the most influential figure in the history of American theatre,” in his acclaimed solo play, “LET IT BE ART!” directed by Gregory Abels. In its 15th year, the play had two critically-acclaimed runs Off-Broadway, seen across 5 continents in 22 countries including London, Paris, Athens, Kathmandu, Mumbai, Bangkok, Buenos Aires, Harare, Belgrade, Tbilisi, Tangier, Paysundu, Barrancabermeja, New Delhi, Zagreb, Minsk, and in 17 states. Upcoming: Sarajevo, India, Italy, Florida and Pennsylvania. (www.LetItBeArt.com). This fall he will be teaching at the Academy of Drama Arts-University of Sarajevo; directing Murray Schisgal’s comedy, “LUV” at the Chamber Theatre 55 with a cast including Zana Marjanovic, Moamer Kasumovic and Muhamed Hadzovic; a Member of the Jury for the International Theatre MESS Festival & perform “LET IT BE ART!” in the OFF MESS. Mr. Rand holds the distinction of being the first American artist invited to Zimbabwe’s BAFA Festival of Arts, the first American invited to Russia’s “Voices of History” International Theatre Festival, and the first American to perform a play in the heart of Colombia at San Vicente’s Cultural Arts Center. (www.LetItBeArt.com) “LET IT BE ART!” also received acclaim at London’s Spiro Ark Theater, Paris’ Filmotheque Theatre, Colombia’s 2nd International Theatre Festival for Peace in Barrancabermeja, Cayman Islands’ Harquail Studio Theatre, Belgrade’s Slavija International Theatre Festival, Athens’ International Festival of Making Theatre, Buenos Aires’ Kafka Theatre, Tangier’s 17th century Sultan’s Palace Dar el-Makhzen at the International Intermediality Theatre Conference, Paysundu’s MerCoSur International Theatre Festival, Minsk’s Palace of Culture, Johannesburg’s Festival of Fame, Bangkok’s Patravadi Theatre, Kerala’s International Theatre Conference, Eskisehir State Theatre, Frankfurt’s Internationales Theater, Zagreb’s Academy of Dramatic Art, and across 17 states in America at New York University, Western Washington University, Syracuse University, University of Missouri-Columbia, Northern Illinois University, Freehold, Cornish School of the Arts and Gonzaga University. 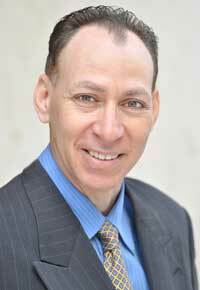 An Adjunct Professor of Acting at Pace University in New York City for four years, he has also been a guest professor at over 75 universities and colleges around the world. As a director, his productions as a director have been seen in New England and New York City, and include “Meltdown: Voices from Chernobyl,” “The Group!” and “Success Story.” In 2012, he co-translated and produced the U.S. premiere Off Broadway at La MaMa of the most famous play by Spain’s leading controversial playwright, Inigo Ramirez de Haro. Beginning his career as a child actor appearing in over 350 plays with a professional children’s theater in Florida, he made his Off-Broadway debut in Julius Caesar at BAM opposite Richard Dreyfuss, followed by numerous performances Off-Broadway, including “Servant of Two Masters’, “Ma Rainey’s Black Bottom,” “Endgame,” “Perfect Crime,” and toured across Europe as the Fool in King Lear. Mr. Rand has made over 200 film and television appearances including Emperor’s Club, In & Out, Family Business with Sean Connery, Rude Awakening as President Nixon, O’Keefe & Stieglitz opposite Christopher Plummer, Quiz Show directed by Robert Redford, and Homeless opposite Yoko Ono. As a playwright, his plays include THE GROUP! about The Group Theatre, and “IBSEN.” His productions as a director have been seen in New England and New York City, and include “Meltdown: Voices from Chernobyl,” “The Group!” and “Success Story.” In 2012, he co-translated and produced the U.S. premiere Off Broadway at La MaMa of the most famous play by Spain’s leading controversial playwright, Inigo Ramirez de Haro. 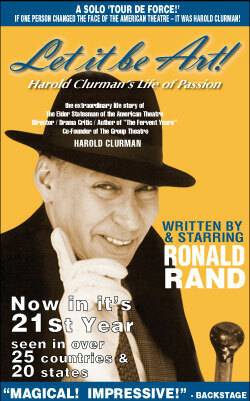 Mr. Rand’s mentors include Stella Adler, Harold Clurman, Jerzy Grotowski, Joseph Chaikin, and Bobby Lewis. He is a member of The Actors Studio Playwright-Directors Unit.